From Manual of Mythology, by Alexander S. Murray; Revised Edition, Philadelphia: David McKay, Publisher, 1895; pp. 63-67. DEITIES OF THE HIGHEST ORDER. Was a divine personification of what may be called the female power of the heavens — that is the atmosphere, with its fickle and yet fertilizing properties; while Zeus represented those properties of the heavens that appeared to be of a male order. To their marriage were traced all the blessings of nature, and when they met, as on Mount Ida in a golden cloud, sweet and fragrant flowers sprang up around them. A tree with golden apples grew up at the marriage feast, and streams of ambrosia flowed past their couch in the happy island of the West. That marriage ceremony took place, it was believed, in spring, and to keep up a recollection of it, an annual festival was held at that season in her honor. Like the sudden and violent storms, however, which in certain seasons break the peacefulness of the sky of Greece, the meetings of this divine pair often resulted in temporary quarrels and wrangling, the blame of which was usually traced to Hera. Poets, and most of all Homer, in the Iliad, describe her as frequently jealous, angry, and quarrelsome, and her character as lofty and proud, cold, and not free from bitterness. Of these scenes of discord we have several instances, as when (Iliad i. 586) Zeus actually beat her, and threw her son Hephæstus (Vulcan) out of Olympus; or (Iliad xv. 18), when vexed at her plotting against Heracles, he hung her out of Olympus with two great weights (earth and sea) attached to her feet, and her arms bound by golden fetters — an illustration of how all the phenomena of the visible sky were thought to hang dependent on the highest god of heaven; or again (Iliad i. 396) when Hera (Juno), with Poseidon (Neptune) and Athene, attempted to chain down Zeus, and would have succeeded had not Thetis brought to his aid the sea giant Ægæon. As goddess of storms, Hera was consistently described as the mother of Ares (Mars), taking part herself in war occasionally, as against the Trojans, and enjoying the honor of festivals accompanied by warlike contests, as at Argos, where the prize was a sacred shield. Her favorite companions, in periods of peace, were the Charitēs (Graces) and the Horæ (Seasons), of which the latter are also found in the company of her husband. Her constant attendant was Iris, goddess of the rainbow. The peacock, in its pride and gorgeous array, and the cuckoo as herald of the spring, were sacred to her. In the spring-time 65 occurred her principal festival, at which the ceremony consisted of an imitation of a wedding, a figure of the goddess being decked out in bridal attire, and placed on a couch of willow branches, while wreaths and garlands of flowers were scattered about, because she loved them. Another singular festival was held in her honor every fifth year at Olympia in Elis: the ceremony consisted in the presentation of a splendidly embroidered mantle (peplus) to the goddess, and in races by girls and married women, with their hair streaming down, and wearing short dresses; the judges on the occasion were sixteen married women. The character, however, in which Hera was most generally viewed was that of queen of heaven, and as the faithful wife of Zeus claiming the highest conceivable respect and honor. Herself the ideal of womanly virtues, she made it a principal duty to protect them among mortals, punishing with severity all trespassers against her moral law — but, naturally, none so much as those who had been objects of her husband’s affections — as, for instance, Semēlē, the mother of Dionysus, or Alcmenē, the mother of Heracles. Her worship was restricted for the most part to women, who, according to the various stages of womanhood, regarded her in a different light; some as a bride, styling her Parthenia; others as a wife, with the title of Gamelia, Zygia, or Teleia; and others again in the character of Eileithyia, as helpful at childbirth. Of the phases of her life, that of bride was obviously associated with the phenomena of the heavens in the spring-time, when the return of dazzling light and warmth spread everywhere affectionate gaiety and the blooming of new life. As queen of heaven and wife of Zeus she will be found, in connection with the legends of Argos and its neighborhood, possessed, from motives of jealousy, of a hatred toward the nocturnal phenomena of the sky, and especially the moon, as personified by the wandering Io, 66 whom she placed under the surveillance of Argus, a being with innumerable eyes, and apparently a personification of the starry system. The town of Argos, with its ancient legends, which clearly betray some powerful sensitiveness to the phenomena of light, was the oldest and always the chief centre of this worship of Hera. There was her principal temple, and within it a statue of the goddess, by Polycleitus, which almost rivalled in grandeur and beauty the Zeus at Olympia by Pheidias. Next came Samos, with its splendid temple erected for her by Polycrates. In Corinth also, in Eubœa, Bœotia, Crete, and even in Lacinion, in Italy, she had temples and devotees. 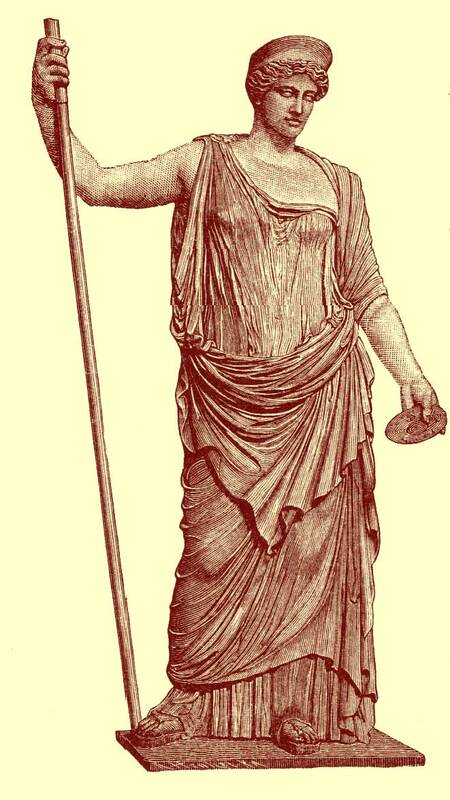 Juno, the Roman equivalent of Hera, was mostly regarded from the maternal point of view, and in accordance with it frequently styled Lucina, the helper at childbirth. Temples were erected and festivals held in her honor — of the festivals that called Matronalia being the chief. It was held on the 1st of March of each year, and could only be participated in by women, who went with girdles loose, and on the occasion received presents from husbands, 67 bands, lovers, or friends, makng presents in turn to their servants. The spirits that guarded over women were called in early times Junonēs. 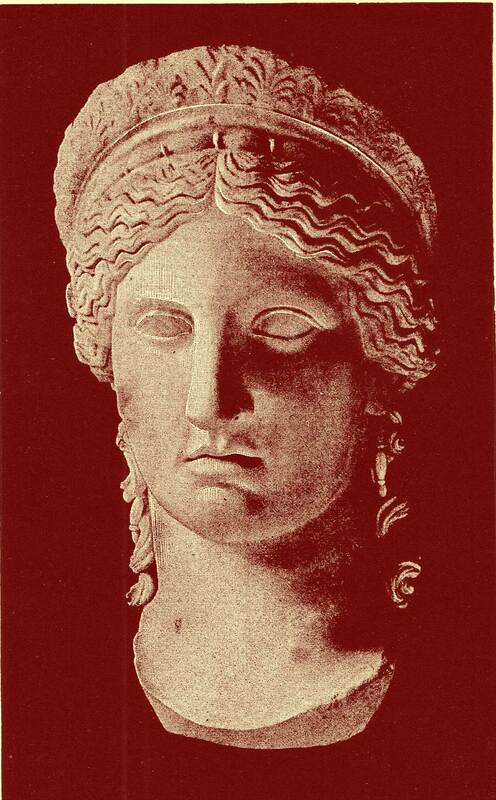 The image of Hera is said to have consisted at first of a long pillar, as in Argos, and in Samos of a plank, and to have assumed a human form only in comparatively late times. The statue of her by Polycleitus, mentioned above, was of gold and ivory, and of colossal size. It represented her seated on a throne, holding in one hand a pomegranate, the symbol of marriage, and in the other a sceptre on which sat a cuckoo. On her head was a crown ornamented with figures of the Charitēs (Graces) and Horæ. We can still in some measure recall the appearance of the statue from the marble head known as the Juno Ludovisi on Plate III., from the coins of Argos, and from several ancient heads of marble of great beauty. Praxiteles made a colossal statue of her in the character of the protectress of marriage rites, and also of a group of her, seated, with Athene and Hebe standing beside her. On the painted vases the scene in which she most frequently occurs is that where she appears before Paris to be judged of her beauty.